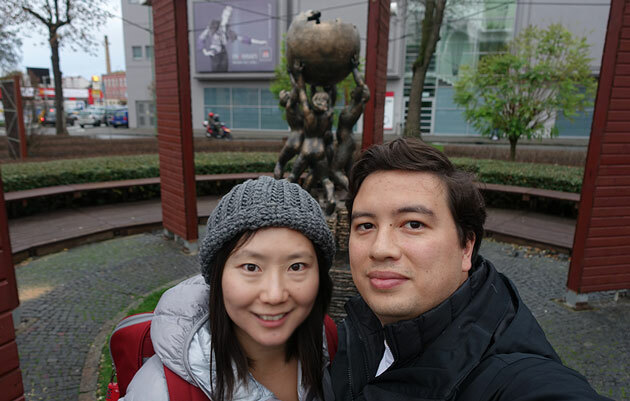 With one extra day left on our Austria/Germany Eurail pass, K and I were keen to do a daytrip to Dresden from Berlin. Unfortunately on the day that we had planned to go, we woke up much later than expected which made the two hour journey to Dresden much less appealing as we would only have a handful of hours to enjoy in that town. We decided not to waste the Eurail pass though, and do something that you could never do in Australia – casually pop over to another country just for lunch before returning home. 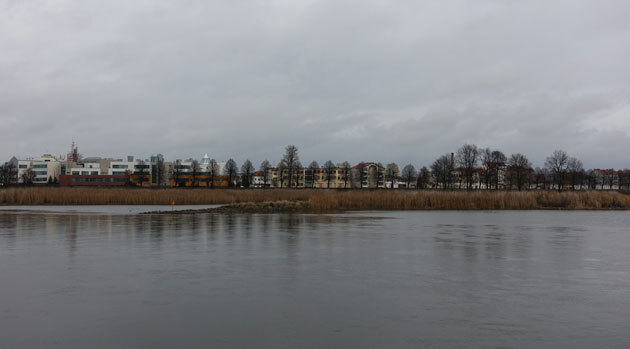 We took the train from Berlin to the little border town of Frankfurt an der Oder, a completely unremarkable little town that acts almost as an outer-suburb of Berlin for those who aren’t put off by the idea of an hour-long commute. 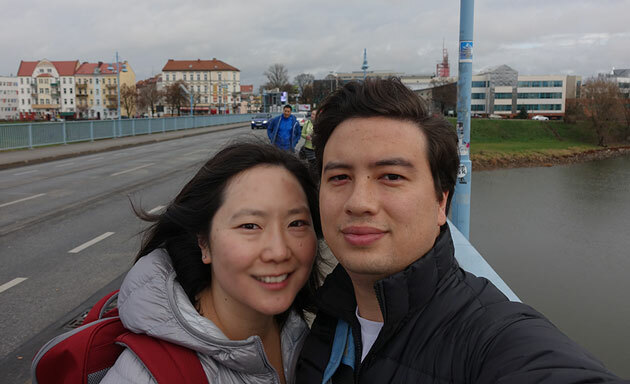 What we wanted though, was to have a taste of Poland before a longer visit later in our trip, and Frankfurt conveniently lies across the border from the Polish town of Slubice (Swoo-bice). 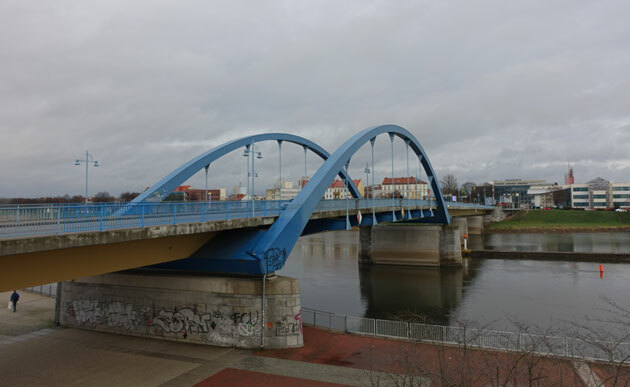 Like Frankfurt, Slubice doesn’t offer much for the average tourist. 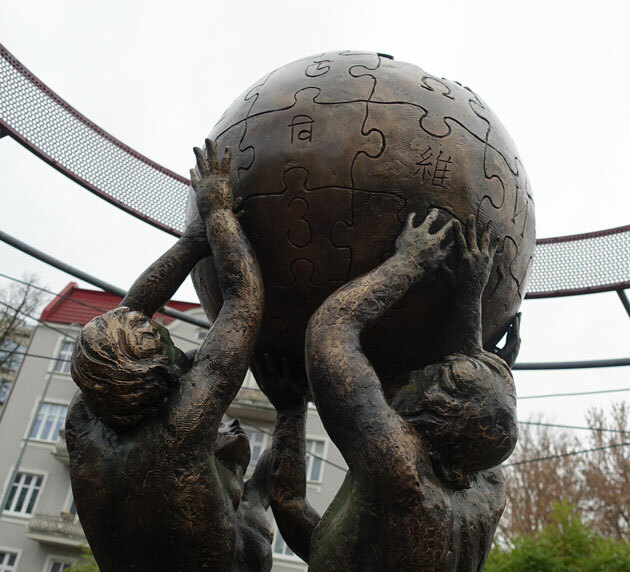 We found the one point of interest in the town, which was a monument to Wikipedia as representative of the collective global effort towards increasing human knowledge. Slubice’s main function seems to be as a border town for German citizens who go to Poland for cheaper goods. 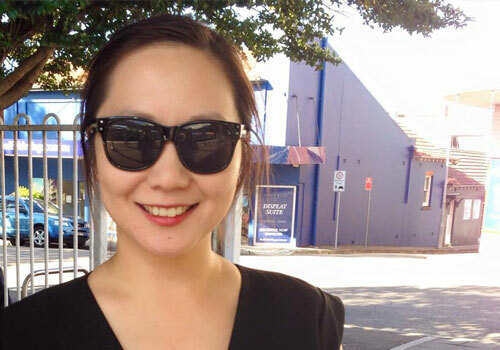 The shops along the main street all sell large packs of cigarettes and giant bottles of alcohol, and there are numerous hairdressing salons…which in hindsight, may be less like a salon and more of a front for other less innocent businesses? Of course, that may just be my overactive imagination! We weren’t there for the cigarettes, the alcohol, or ‘haircuts’ though. 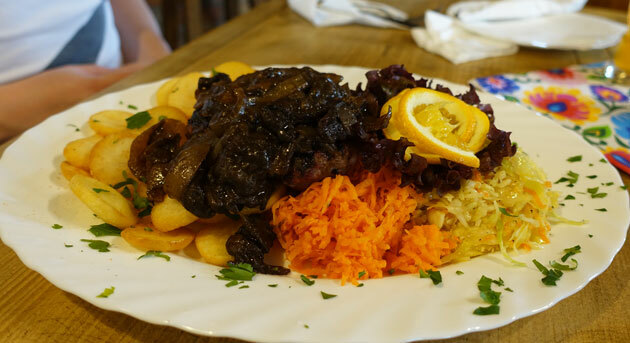 What we wanted was an initial taste of Polish cuisine before a longer visit later in our trip. 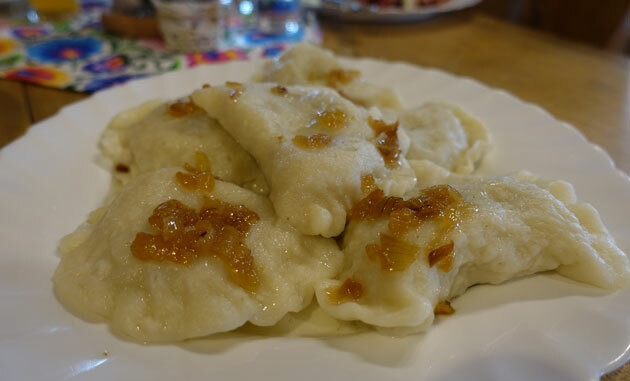 While we’ve obviously had Polish food before in Australia (the Polish Place in Tambourine Mountain comes to mind), it’s always a tasty idea to reacquaint oneself with dishes like pierogi! 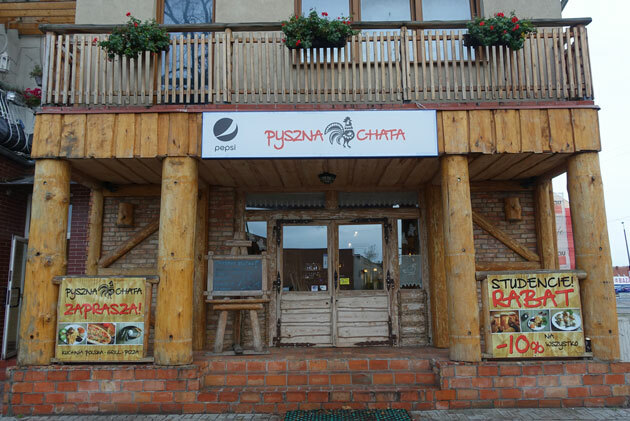 We found Pyszna Chata through Tripadvisor, as one of the top restaurants in Slubice…which isn’t saying much when there’s only about 12 restaurants in the whole town of course! 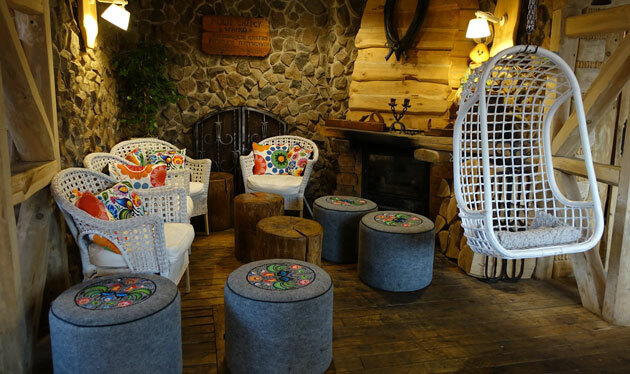 Still, the descriptions from reviewers of a cute wooden hut and traditional Polish cuisine drew me to Pyszna Chata as our restaurant choice. The menu was written only in Polish and German, which made it interesting for us in trying to decipher the descriptions. You know you’re gambling on making the right choice when you end up relying on your almost non-existent German knowledge of random words such as “rind” and “kartoffel” to give you a slight indication of what the dish may be. 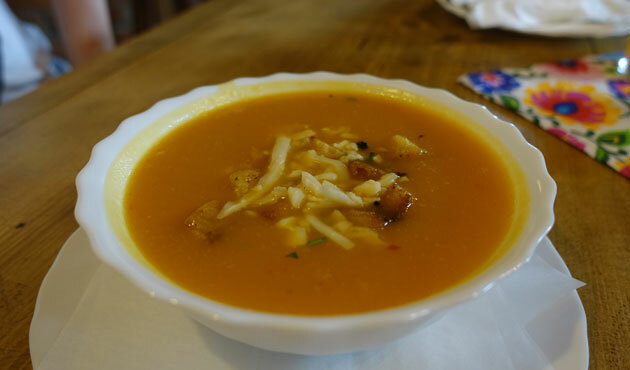 We lucked out on ordering the soup – a creamy sweet pumpkin and capsicum soup with added shredded cheese on top for additional flavour. The soup also included what seemed like bits of caramelised onion and just a hint of fresh parsley, creating a dish that was hearty and warming to counteract the bad weather. We weren’t so lucky on our choice of salad. While there were standard offerings such as Caesar salad on the menu, I thought I’d take a chance on the Pyszna Chata house salad…which proved to be the wrong choice. The shredded iceberg lettuce was pretty standard, but the fried chunks of pig liver was much less palatable, actually inedible for all but lovers of offal. I believe the raspberry sauce on top was supposed to sweeten the harsh dirty flavour of the liver, but it only served to accentuate what was already distasteful. 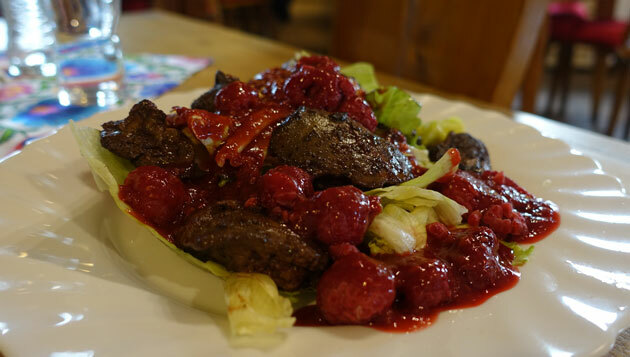 K gamely ate a few bites of the salad so as not to waste it, but I left it after only a single bite – this is one best left unordered unless you particularly enjoy liver! We were a bit luckier with our choices of mains. K chose a standard lunch special of a ‘steak’ which actually turned out to be fried hamburger patties…not quite the chunk of meat he was expecting, but not a bad meal nonetheless. While the patty was a bit overcooked, I enjoyed the super crunchy and crispy fried sliced potatoes on the side, as well as the three different types of salad on the plate as a healthier change of pace – traditional coleslaw, beetroot slaw, and carrot slaw. I chose the cabbage pierogi, only because I couldn’t decipher what the other pierogi options were, and figured that cabbage was a safe bet. I’m glad I made this choice as these vegetarian pierogi proved to be some of the best I’ve eaten before – not as oily as those from The Polish Place, and not too doughy either. The spiced cabbage filling was quite delicious, almost Asian-inspired in its choice of spices, which worked particularly well with the caramelised onion topping. If it hadn’t been for our entirely unfortunate choice of a salad, our meal at Pyszna Chata would have been quite enjoyable. It’s definitely one of the better options for a decent Polish meal in the little town of Slubice. As it is though, I think our most important learning from our quick lunch visit to Poland is that we need to do some research before we return. What are some key food words, and more importantly, what is the word for liver in Polish so we never end up ordering it again?! Pyszna Chata is located at 163B Wojska Polsiego, Slubice Poland.